Our Shanette range of buildings are built to the European and BSI building regulations which gives you peace of mind that you are buying a unit that is built to last. With an extensive variety of sizes, styles and finishes, we can custom build your unit to suit your budget and needs. Hanson Garages are delighted to introduce the Shanette Range of garages & sheds, giving you access to one of the most extensive selections of insulated PVC coated metal garden sheds & garages in the UK and Ireland. 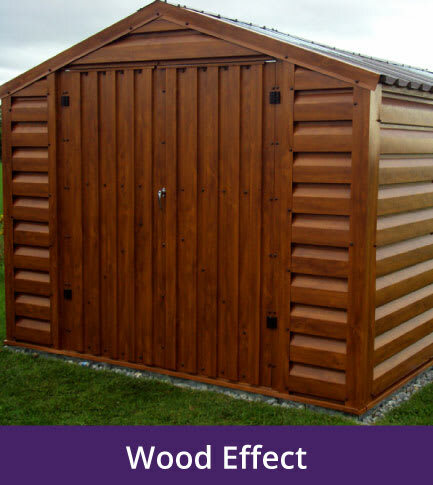 Possessing over 30 years’ experience in the manufacture of sectional metal buildings, a Shanette shed or garage unit offers fantastic value for money, elegant design, an attractive finish and a reliable storage solution designed to stand the test of time. Whether you choose from our Gold, Silver or Bronze range you’re guaranteed quality. 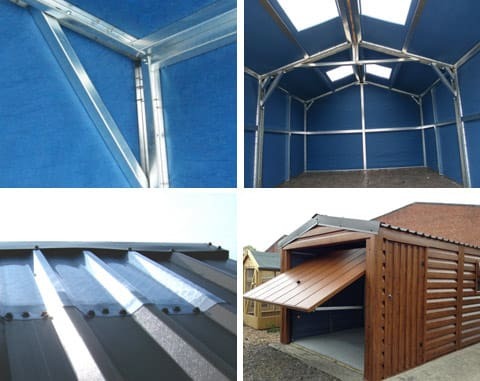 Each shed and garage is constructed utilising the strongest galvanized frames on the market and a highly sophisticated roof insulation system to ensure that your purchase never succumbs to the weather. 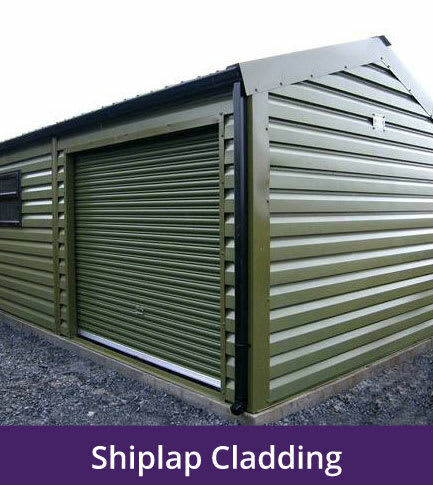 Adhering to all current building regulations, a Shanette shed or garage won’t even require any form of future maintenance courtesy of the PVC coated shiplap applied to their exterior. Looking for something specific? 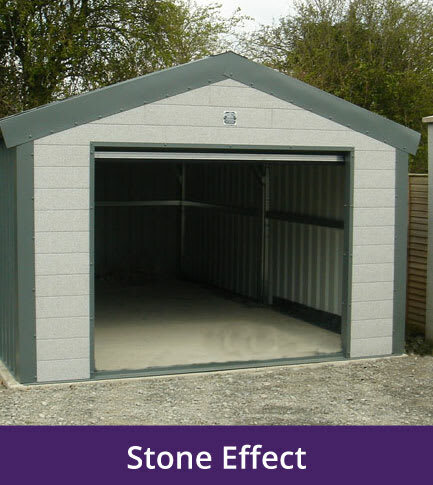 We can cater for all tastes, custom-building sheds and garages to suit your home and individual taste, coupling it with fast and efficient installation. Note: Colour samples are for guidance purposes only. All units are available in our standard PVC colours. 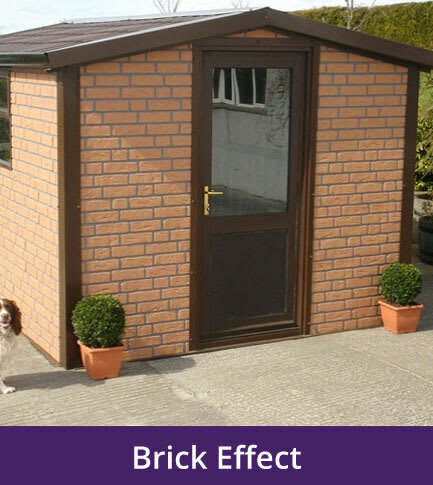 Alternatively, all of our shanette sheds & garages can be finished with a Brick, Stone, Shiplap or Wood effect facade. An external facade gives a very attractive finish to any Shanette unit and can be fitted on all sides of your unit or just the sides that are visible. Why not upgrade your unit today? 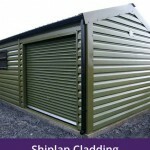 25mm Roof Insulated units come in various sizes and styles with horizontal Shiplap cladding as standard. Special 25mm roof insulation system means NO CONDENSATION dripping on your stored items. This system stops water droplets forming on the roof cladding and roof steel framework. 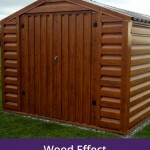 Shanette range of sheds & garages are the strongest galvanized frames on the market, designed by Structural Engineers. 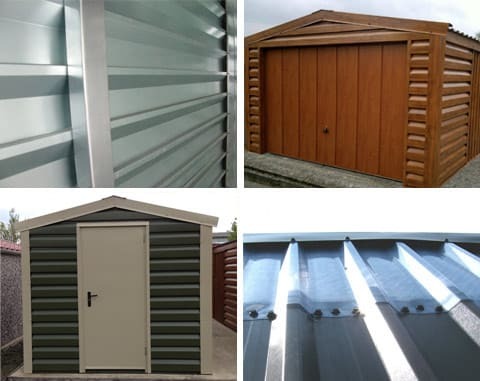 High tensile structural grade steel is used on all units and PVC coated shiplap cladding on all exteriors, this leaves you with a MAINTENANCE FREE UNIT. We are committed to using only the highest quality products within our buildings and have chosen Hormann, Europe’s No1 manufacture of up & over doors. Their extensive range offers superior design, engineering excellence and outstanding security. Doors are fitted with fully retractable action with a steel fixing frame for extra rigidity. OPTIONAL: Polycarbonate plastic clear roof sections that won’t discolour and will allow natural light to shine through your unit, reducing the need for electric lighting during the day. 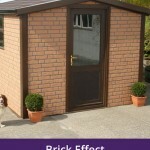 Features 25mm Roof and Wall insulated units which are available various sizes and styles. Special 25mm roof &wall insulation system insures NO CONDENSATION dripping on your stored items. This system stops water droplets forming on the roof cladding and roof steel framework. 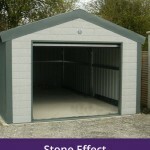 Shanette range of sheds & garages are the strongest galvanized frames on the market, designed by Structural Engineers. High tensile structural grade steel is used on all units and PVC coated cladding on all exteriors, this leaves you with a MAINTENANCE FREE UNIT. We are committed to using only the highest quality products within our buildings and this is why we have chosen Hormann, Europe’s No1 manufacture of up & over doors. The range offers superior design, engineering excellence and outstanding security. Doors are fitted with fully retractable action with a steel fixing frame for extra rigidity. OPTIONAL: Polycarbonate plastic clear roof sections that won’t discolour or fade and will allow natural light to shine through your unit, reducing the need for electric lighting during the day. Features Kingspan 40mm Insulated Roof and 40mm Insulated Walls with an external Vertical designed panel. All units are available in our standard PVC colours as detailed overleaf, the choice is yours! 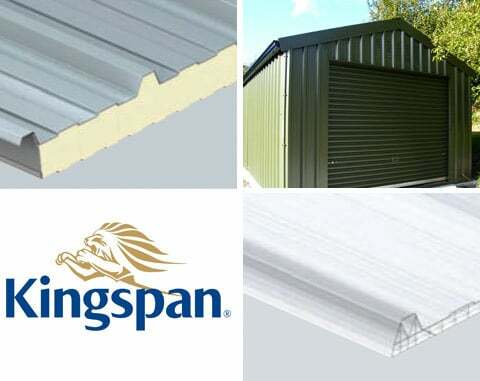 We use a 40mm thick Kingspan Insulated composite panel throughout the unit in The Gold Range. This insulation insures that anything you store will remain safe and dry, whatever the weather brings. Kingspan panels are FIREsafe and insurer approved. The Kingspan Insulated Gold Range has the added advantage of retaining heat when heated. , fully insulated means more energy efficient,which means lower fuel bills.Optional insulation thickness available in 60mm, 80mm & 100mm. The Kingspan insulated panel have a guaranteed U value. OPTIONAL: Insulated polycarbonate plastic clear roof sections that won’t discolour and will allow natural light to shine through your unit, reducing the need for electric lighting during the day.